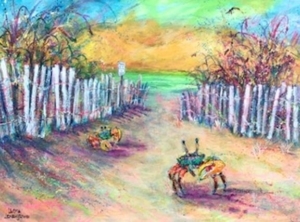 Home/Art, Gallery/Stone crab season is here! 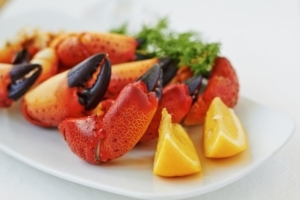 The onset of winter in Florida not only brings wonderfully mild sunny weather but also the eagerly anticipated annual harvest of stone crab claws. 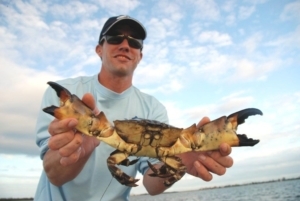 Stone crab season opens today …. And runs through May 15. If you’ve never had them before, you have to try this delicacy from the waters of the Gulf of Mexico. One great way to sample stone crab is at one of Southwest Florida’s numerous stone crab festivals. There’s a really e xcellent one down in Everglades City, and they can use our support after the devastation they suffered as a result of Hurricane Irma. 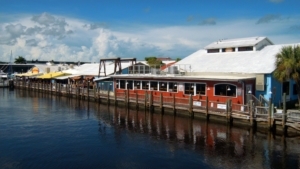 Another is the Naples Stone Crab Festival, which kicks off on October 29 at Tin City and continues on Saturday at the Tin City Waterfront Shops block party and Kelly’s Fish House at the Port of Naples Marina. 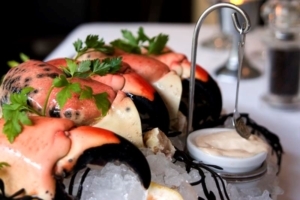 Both events have live music, kids’ events, specialty drinks and, of course, stone crabs. And did you know that if the claws are harvested correctly, the crab lives and the claws grow back! E ach time a crab molts, it has the ability to regenerate the lost appendage. Regeneration in adult crabs takes one year due to the seasonal molting of adult females in fall and adult males in winter. The regenerated claws start out smaller than the original and will continue to grow through subsequent molts. After three molts (three years in adult crabs) a claw can regain 95 percent of its original size. 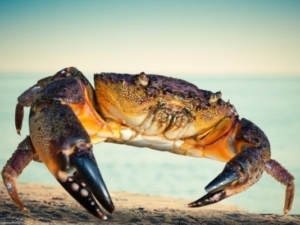 According to the Florida Fish and Wildlife Conservation Commission, nearly all stone crabs will survive if they are declawed properly. Now you’d think it would be impossible for the crab to eat and avoid being eaten if it loses both claws. But that’s not the case. 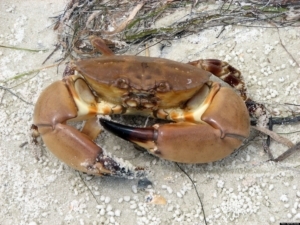 Stone crabs simply change their behavior from predator to scavenger. They rely more on c oncealment and scavenging rather than foraging in more open areas. Of course, feeding for stone crabs who are missing one or both claws is more difficult, particularly if there is competition for resources and to hold territories. Defense against predators would also be more difficult or require a different strategy. However, their main predator, the octopus, is designed to prey on them whether they have claws or not. To the right is my homage to stone crabs! In fact, it’s one of the images that appears on articles from by Leoma Lovegrove line at Bealls. And now that it’s almost tourist season, be sure to come visit us on Matlacha Island. The art here is always hot and enticing, and there’s plenty of other fresh seafood to please even the most discriminating palette.